I don’t say “Thank You” as often as I should and I doubt I’m the only one. In fact, I’m starting to believe that “Thank You” is the most under-appreciated and under-used phrase on the planet. It is appropriate in nearly any situation and it is a better response than most of the things we say. 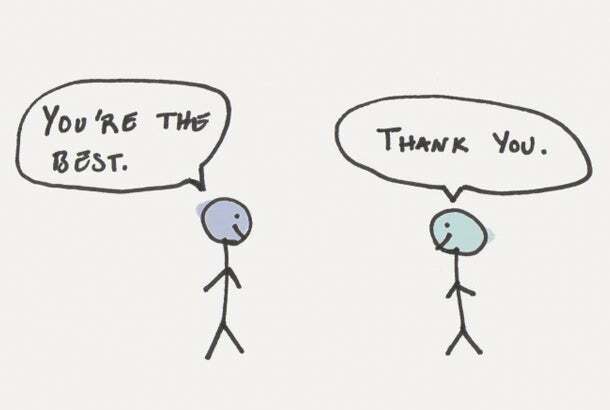 Let’s cover 7 common situations when we say all sorts of things, but should say “Thank You” instead. 1. When you’re receiving a compliment. We often ruin compliments by devaluing the statement or acting overly humble. Internally, you might think this prevents you from appearing arrogant or smug. The problem is that by deflecting the praise of a genuine compliment, you don’t acknowledge the person who was nice enough to say something. Simply saying “Thank You” fully acknowledges the person who made the compliment and allows you to enjoy the moment as well. 2. When you’re running late. Being late is the worst. It’s stressful for the person who is running late and it’s disrespectful to the person who is waiting. The problem is this response still makes the situation about you. Sorry, I’m late. Saying “Thank You” turns the tables and acknowledges the sacrifice the other person made by waiting. Thank you for waiting. Example: You walk in the door 14 minutes late. When we make a mistake, someone else often makes a sacrifice. Our default response is to apologize for our failure, but the better approach is to praise their patience and loyalty. Thank them for what they did despite your error. 3. When you’re comforting someone. When someone comes to you with bad news, it can be awkward. You want to be a good friend, but most people don’t know what to say. I know I’ve felt that way before. What we fail to realize is that it doesn’t matter if you don’t know what to say. All you really need is to be present and thank them for trusting you. Example: Your co-worker’s mother passed away recently. Example: Your brother lost his job. Example: Your friend’s pet just died. In times of suffering, we don’t need to hear words to ease the pain as much as we need someone to share our pain. When you don’t know what to say, just say “Thank You” and be there. 4. When you’re receiving helpful feedback. Feedback can be very helpful, but we rarely see it that way. Whether it is an unflattering performance review from your boss or an email from an unhappy customer, the standard reaction is to get defensive. That’s a shame because the correct response is to simply say, “Thank You” and use the information to improve. Nobody likes to fail, but failure is just a data point. Respond to helpful feedback with thanks and use it to become better. 5. When you’re receiving unfair criticism. Sometimes criticism isn’t helpful at all. It’s just vindictive and mean. I’ve written about how to deal with haters previously, but one of the best approaches is to just say thank you and move on. When you thank someone for criticizing you, it immediately neutralizes the power of their statements. If it’s not a big deal to you, then it can’t grow into a larger argument. Releasing the need to win every argument is a sign of maturity. Someone on the internet said something wrong? So what. Win the argument by the way you live your life. 6. When someone gives you unsolicited advice. This shows up a lot in the gym. Everybody has an opinion about what your technique should look like. I think most people are just trying to be helpful, but hearing someone’s opinion about you when you didn’t ask for it can be annoying. One time, someone pointed out some flaws in my squat technique in a video I posted online. I responded by sarcastically asking if he had a video of himself doing it correctly. Somewhere deep in my mind, I assumed that if I reminded him that his technique wasn’t perfect, then I would feel better about the fact that mine wasn’t perfect either. That’s an unnecessary and defensive response. Pointing out others faults doesn’t remove your own. Thank people for raising your self-awareness, even if it was unsolicited. 7. When you’re not sure if you should thank someone. When in doubt, just say thank you. There is no downside. Are you honestly worried about showing too much gratitude to the people in your life? “Should I send a Thank You card in this situation?” Yes, you should. “Should I tip him?” If you don’t, at least say thank you. Say thank you, more often. For more advice and useful ideas, join his free weekly newsletter.